DY-PS Primer Sprayer is used to evenly spray primer onto the ground, to enhance the adhesion of thermoplastic road marking paint and ground. 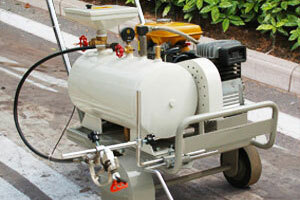 Piston type abrasion resistance air compressor engine ensures the flow much larger and the pressure more stable. 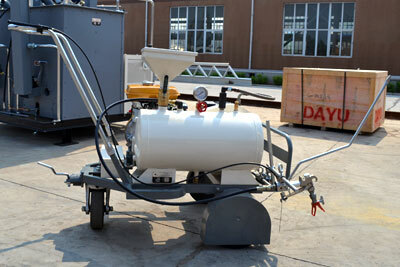 Primer storage pot is equipped with pressure safety valves, with a sieve in the feeding port. New type spray gun controlled by brake handle, with hard side columnar reverse wash nozzle, ensures removing plug conveniently and quickly; the non-arc nozzle ensures the base line precise alignment. A firm welded frame; chrome-plated or corrosion resistant coating sprayed surface; high-speed bearing ensures the whole machine light and convenient to move. Front wheels and rear wheel are special natural modified rubber wheels. Guide rod can be adjusted freely in all directions, up, down, left or right. 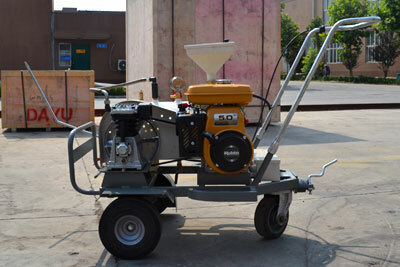 The height of handle bar can be freely adjusted according to the needs of machine operator. 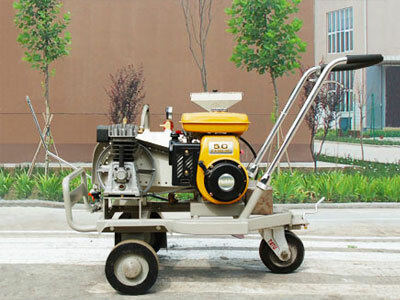 Rear wheel directional device is lockable that ensures the primer spraying machine moving in straight lines and turning freely in curved road.